Yours with any upsized Extra Value Meal™. Only from 21 – 22 April. 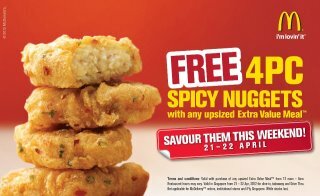 Valid with any upsized Extra Value Meal™ from 14 April -15 April 2012. Valid in Singapore dine-in and take away. Not applicable for McDelivery order, institutional stores and iFly Singapore.